Provide comfort for the family of Raymond Kelly with a meaningful gesture of sympathy. Raymond Morgan Kelly, better known as Buddy, 86, passed away on February 15, 2019. He was born on March 19, 1932 in Pensacola, Florida to his parents, John W. and Fannie Mae Kelly. Buddy was a wonderful man, who raised 7 children not of his blood line, but loved as his own. He is an Army Veteran who served his country proudly. Buddy will be missed dearly. He is preceded in death by his parents, John W. and Fannie Mae Kelly; and the love of his life, Toni (Shug) Kelly. Buddy leaves to cherish his memories his children, Walter McCartney, Glenda Wynn, Ray McCartney, John McCartney, Charles McCartney, David McCartney, Scott McCartney, and Alex Loving, and numerous grandsons, granddaughters, and great grands. A special thanks to all staff at the Olive Branch Rehabilitation Center that helped care for our Father. Visitation will be held on Thursday, February 21, 2019 at Trahan Family Funeral Home in Pensacola, starting at 2:00 p.m., with the service starting at 3:00 pm. 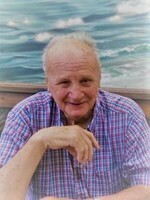 To send flowers in memory of Raymond Kelly, please visit our Heartfelt Sympathies Store. Provide comfort for the family of Raymond Kelly by sending flowers. He will be truly missed. What an awesome man to do what he did for us. Always there when needed. Thank you "Knucklehead" for everything you did for me growing up.